I've been wanting to build a CNC for a long while. I've tried one last year, just like the one in this video: https://www.youtube.com/watch?v=zgbCy2tQg9Y but had a lot of problems with jagged movement. 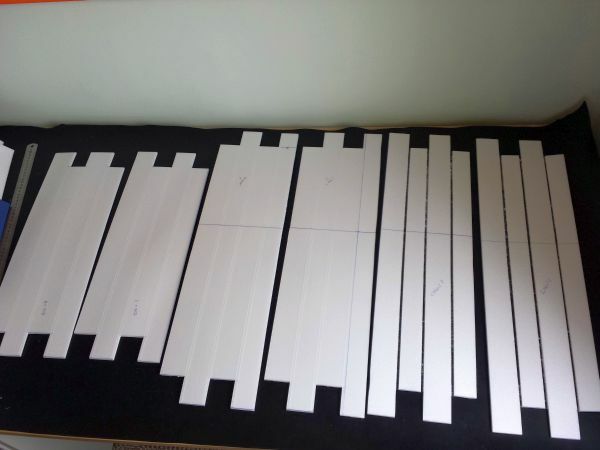 This week I decided to scavange all parts I had laying around and start a new build with a clear objective: Build the cheapiest CNC possible that can accurately cut a foam sheet (Since I'm from Brazil I can only get Depron, which comes in 680 x 1000mm). It alse has to be portable and somewhat compact since I have to put it away when not using. 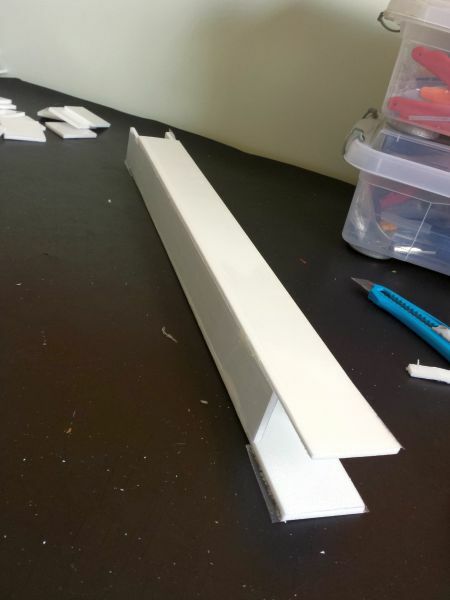 I was wondering how to build it without investing in linear guides/wooden frame when it hit me, if there is one thing I'm good at is building with foamboard (Lots of plane crashes, hehe). 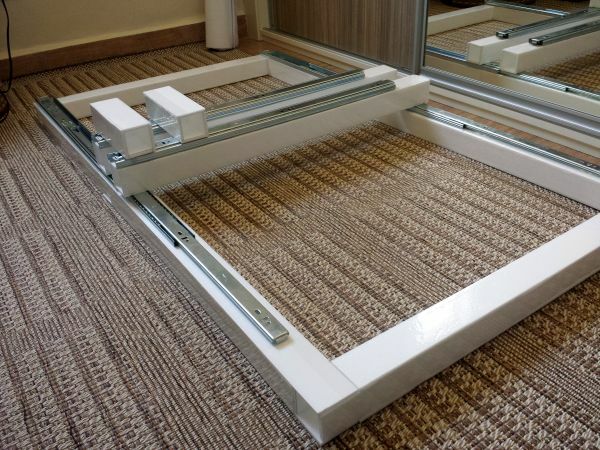 The idea is to use foambord for the frame structure, drawer sliders for linear guides and a hot soldering iron (With a modified tip) for cutting depron. The drawer slides are detachable, so it makes it kind of compact to store under my bed. The system is run by an arduino board (This is the only part that did work well last time). For now I'm stuck with threaded rods for movement, but I'm ordering some timing belts from china to upgrade it afterwards (It is impressive how expensive the belts are in Brazil, I bought 10m + pulleys for the same price I would pay for 2m here). So this is how far I got this week. I can only work on it on fridays so it may take a while to finish it but if you have any suggestions feel free to make it! For the frame, I've build 50x50mm blocks. X axis is made from 2 block per side, adding up to 1.2m. 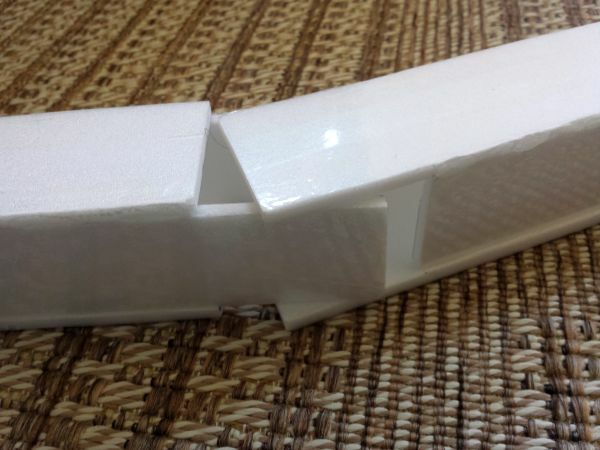 Y axis is made from 1 block per side being 0.7m long. This will give me 1.1m x 0.6m of working area (A little less after I figure out how to install the soldering iron, which I'll use balsa in order to not melt the frame). 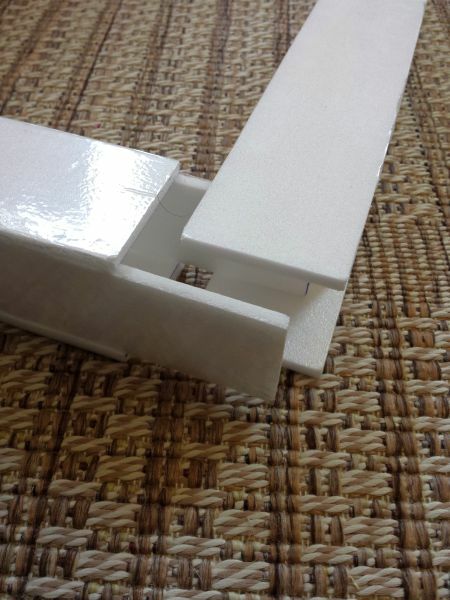 Blocks have internal square "braces" for extra strength, and are built using A and B style folds. They turned out very strong and lightweight. Blocks have interlocking ends, the X axis blocks can be joined and the Y axis lateral block can also be joined. The Z axis is still under development in my head. 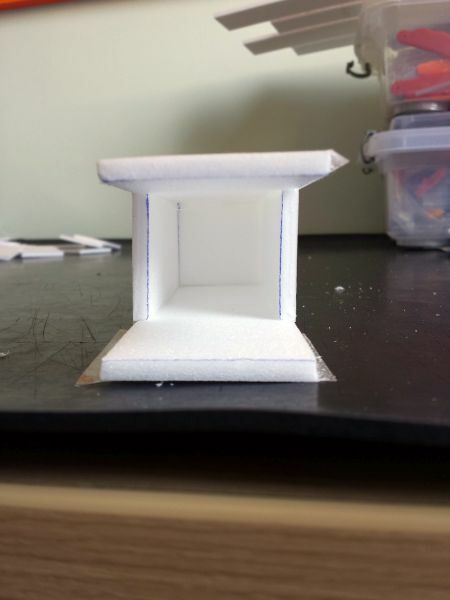 I believe I'll use balsa+foam as guides, since I'm looking at 20mm of movement at most. 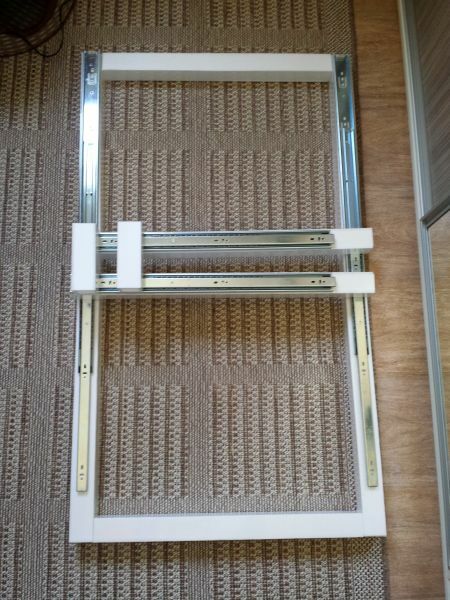 I have a spare set of drawer slides for this, but they are 200mm long, which I believe is overkill for what I need. I guess that's all for now. I'll update the post with new pictures next friday and if everything goes well I'll be on vacations after that so I can speed up the build. A foamboard foamboard cutter....ambitious! Very curious to see how this turns out. Won't be stiff enough to do much more than foamboard, but could work and give people a nice very low cost option! Very cool idea! Can't wait to see how it turns out. First try of the Z axis in action. This is just to prove the concept. It was planned in my head but had a lot of modifications as I built it. It is made entirely of depron foam, balsa, bbq skewers, straws, a threded rod and a nut (Expect for the eletronics). There is a bit of an alignment issue between stepper and shaft and too much play between bbq skewers and straws that act as linear guides (Easy to fix but was not done so when I had the chance....). For now it will do, later on I plan on assembling a new one with tigher tolerances, as I now know where I'll be facing problems. 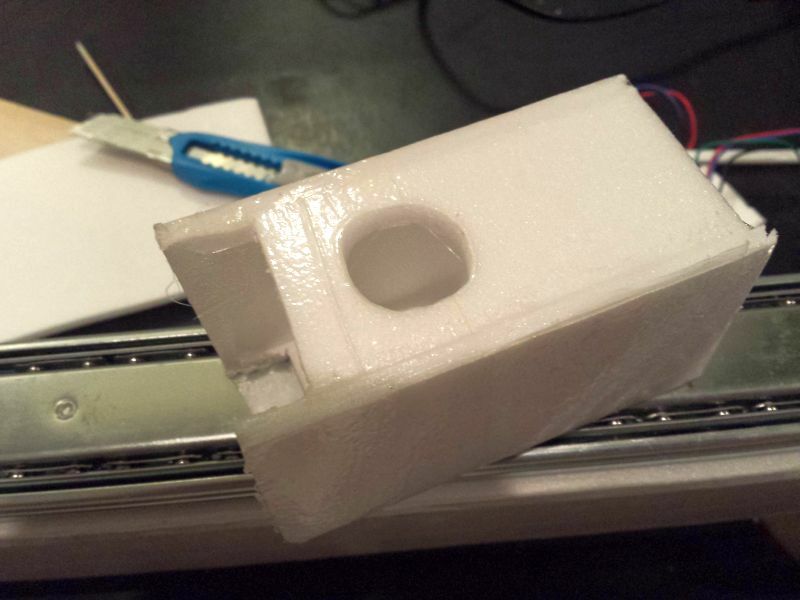 I'm moving on to the Y and Z axis, in order to try to get it working by mid next week. Then I"ll work on improvements for the Z-Axis (Most likely the weakest point since everything else will be using drawers slides as guides). I also do not like the idea of threaded rods for the X-Y axis, so I may try to do something with a fishing line as if it were a timing belt. Next axis on the Foam Cutter made from foam... It works like a charm! Took me all day long to figure out how to piece it together but the end result was amazing. Now moving on to the X axis and the to cutting! Later on I'll post pictures of the cutter itself, it is also working well! Time to show off the cutting tool. 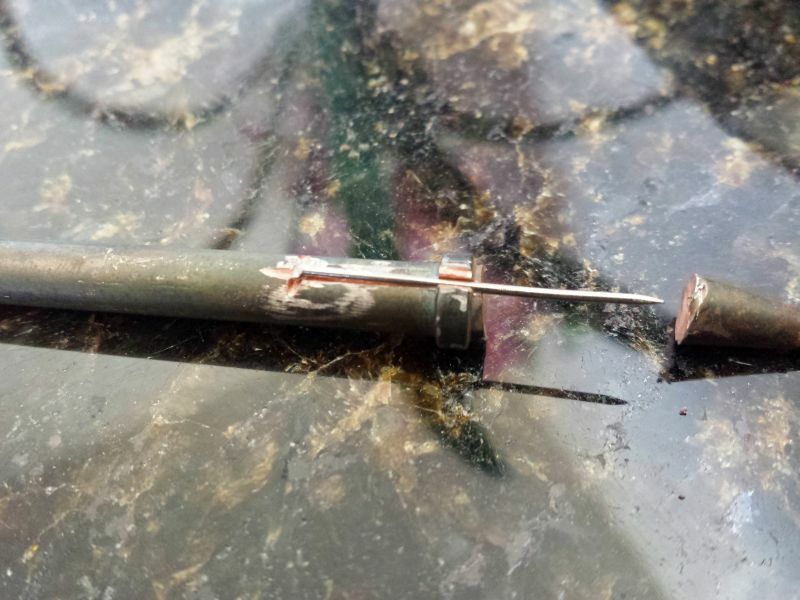 I made it by removing the inside of my soldering iron, cutting off the tip (Yes, Ill need a new one after that), making a slot on it's side and attaching a pin on this slot. When I put everything back together, the tip protudes for 15mm on the end of the iron, which is good to cut the 5mm foam but is far enough that the heat from the iron will not melt it. I have not installed it yet on the Z axis, but I've been using it to manually cut the pieces that I need to complete the CNC (Specially roung holes, which are quite dificult to get with a blade). 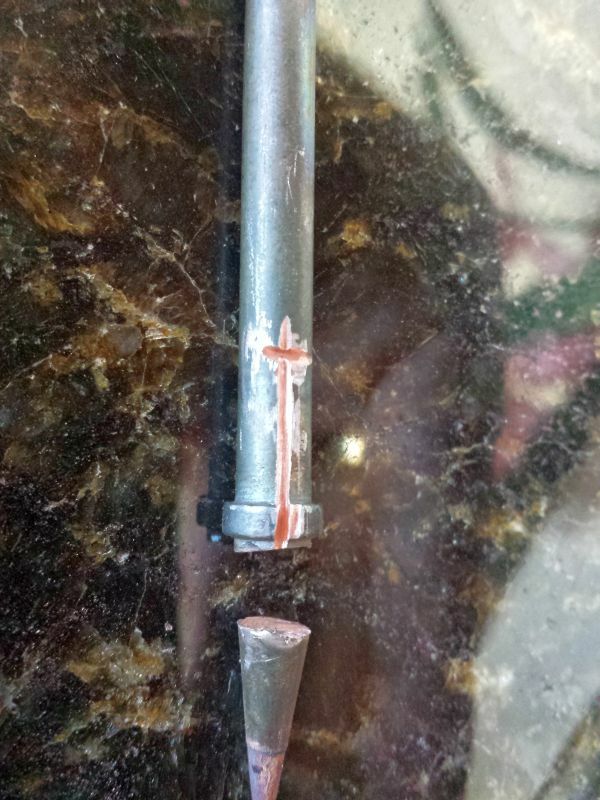 It can easily cut the foam, even if it has packing tape on it. It also gives very strong edges to the cuts, which I guess comes from the foam melting and hardening at the edges. If everything goes well tomorrow I'll have the X Axis ready! Is wood expensive where you are? Over here it seems like foam would actually cost more. Not expensive, just harder to work with if you do not have the tools already or if you have to make last adjustments to the plans. I've been writing down everything that needed to be changed from the initial plans so if everything goes well, by the end of the year I'll upgrade it to use the belt and pulleys and I might change the frame for a wooden one (It will need to be colapsable for storage purposes, so I believe wood is the better choice). All is set to work on the X Axis tomorrow. I gotta build a Bloody Baron by Friday as a donation to my flight club, but I'm postponing it as much as I can so I can cut it with the CNC. Any more progress? I'd like to see how this turns out. I've always read that any well made cnc router is capable of cutting the material it is made from. Therefore if you only ever want to cut foamboard then you make it from foamboard!